Confused about what to use for your swimming pools sanitizer needs? Well you’re not alone, lets try to clarify a few things and make it a whole lot easier. First off what size pool do you have/how many gallons. 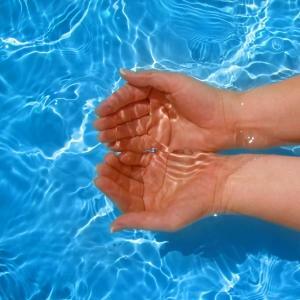 Smaller less volume bodies of water can be easier to handle than larger ones depending on the choices you make. Let’s take a 15k gal pool, say 16’x32′ shallow or smaller. Something of this size can manage just fine on almost any system with very little work involved. Small chlorine feeders, bromine feeders, pristine blue systems, even salt generators make easy work of keeping sanitizer levels stable even in the most extreme summer weather. A big factor is the surface area exposed to outside influences is smaller and thus the sun and heat plays less of a roll in trying to grow “that green stuff” we all know as algae. You’ll need less chemicals to keep your levels to what they should be and that can save you money as well. Now lets talk about the mid sized to large pools, we are talking about sizes 18’x36′ on up to the true “L”, in terms of gallons 20k/ 40k. Now, depending on what sanitizer method you choose there will be cost and maintenance differences. Since chlorine can get ripped out of the water so easily by the hot sun in summertime, you will need to manage that a little more closely and keep some granular shock on hand to help out after a heavy bather load. Bromine works well in any situation since it has always worked best in hot tub’s at 102/deg it’s not as affected by the sun and outside influences like chlorine. Pristine blue also has a good track record for most any size pool you will just need more of it to maintain your levels. Salt generators work very well especially on larger pools, yes they make chlorine for you but with the salinity of the water (not that you notice) working with the generator your levels stay a lot more consistent and best of all you have no actual chlorine to add yourself! Technology has made a big difference in the ease of keeping your pool water chemistry in line make sure you take advantage of it. 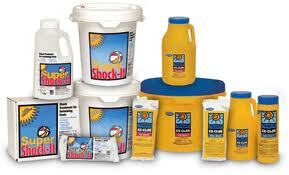 E-Z CLOR offers an extensive line for sanitizing, shocking and safeguarding your pool. Each product is formulated to be both effective and easy to use. E-Z CLOR takes care of your pool – down to the last water drop – and you can take care of the fun. 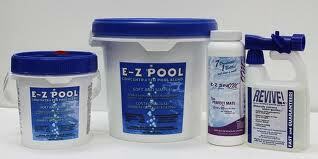 Exceptional pool care made simple – that’s the E-Z way. Going Non-Chlorine is easier than ever with PristineBlue®. Water treated with PristineBlue® feels softer and looks inviting without a chemical taste or odor. It’s gentle to equipment and won’t bleach your liner or swimsuit. You can swim immediately after application. Your eyes won’t burn…and you won’t believe how good your skin and hair feel after swimming! Learn more about PristineBlue® Products. water conditioner and balancing agents all blended in one convenient granular formula. hardness scaling while reducing overall chlorine demand.